The Analysing Diamond Miners Presentation, given by RBC Europe Limited to the Association of Mining Analysts on 30th March 2017, is now available to AMA Members. 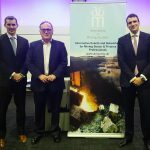 Our thanks to Richard Hatch and Des Kilalea of RBC (www.rbccm.com) and to William Lamb CEO Lucara (www.lucaradiamond.com) for their informative presentation and guidance. This presentation is only available to AMA members. Login or subscribe to view. Back in April, Chris Wilson and Andrew Tunningley of Exploration Alliance gave a presentation to members on High Sulphidation Epithermal Deposits. 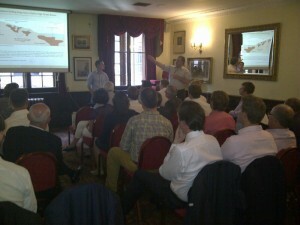 The event, held in the Griffin Room of the Counting House pub, proved to be both enjoyable and informative. On Wednesday 26th March, Nick and Tommy headed to Westminster Parliament in London to meet the Deputy Minister of Mines for Zambia, Hon. Richard Musukwa MP at an event sponsored by the UK Trade & Investment (UKTI) department. The meeting was held in an oak panelled room overlooking the London Eye just off the bustling corridors of the House of Commons and included attendees from all areas of the mining industry who had an interest in Zambia. So another year and another Indaba has gone by, but was it any different this year? On paper it looks like a huge success, almost 8,000 registered with probably that number again “attending” and lounging by the side of the Cullinan pool. Talking to attendees one received a very mixed view, particularly dependent on whether one was buy side or sell side, though the service providers, who seem to be growing in number each year, all had smiles on their faces as they enjoyed the Cape Town weather, presumably they were from the north hemisphere where sun and chardonnay in February is a novelty. Generally exploration companies had an optimistic air about themselves talking about a window of opportunity and that accessing capital looked likely – how this will translate in reality we shall soon see, it was definitely not a view shared by every fund manager or analyst. Meanwhile development stories seemed to be getting a little more traction with talk of one or two West African gold companies making good headway. The NE of Africa is starting to get a little more attention and this despite the recent troubles in Egypt and South Sudan; the geologic prospectivity of the region is well known and companies it would appear are starting to take a good look at the opportunities which exist. As usual investment banks were there in force talking about how this will be the year of M&A, for the third time running…. This year we have offered a wide range of events. Our aim has been to provide both topical events, such as the Gold Debate, as well as more corporate focused events, like the Finland Mining Day. With the help of Exploration Alliance and Wardell Armstrong we have also offered more technical presentations. With the technical presentations our objective is to offer an informal learning environment where experts from different disciplines can fill in any knowledge gaps. There's talk of another Bre-X style con/saga in the Canadian market as two consultants, Strathcona and Snowden, battle it out over sampling methodology. The two companies are working on Pretium's Valley of the Kings deposit, part of the Brucejack project, in BC, Canada, with the company having already paid a heavy price for the uncertainty over its resource at the project. Again, we wonder how the reputation of consultants can be tied to the accuracy of feasibility studies, and who polices the consultants? Chris Wilson and Andrew Tunningley recently made time in their busy schedules to give AMA members a presentation on low-sulphidation epithermal deposits. The talk covered the subject from grass roots exploration through to development. The gents gave good insights into what to look for as well as what to look out for when assessing epithermal deposits. Every year we like to hold a metals outlook event aimed at giving insight into underlying commodity prices and markets that govern the profitability of mining companies. This year we were fortunate to have Control Risks host the event which was followed by wine and beer with fantastic views from their offices on the southern bank of the Thames. The committee and our web designers (Tribus Creative) have been working hard to bring you a new website which I hope you will all enjoy. Our goal was to make the site more member-orientated and take advantage of the new ways in which we can communicate with you.